Thinking of using black in your wedding color palette? 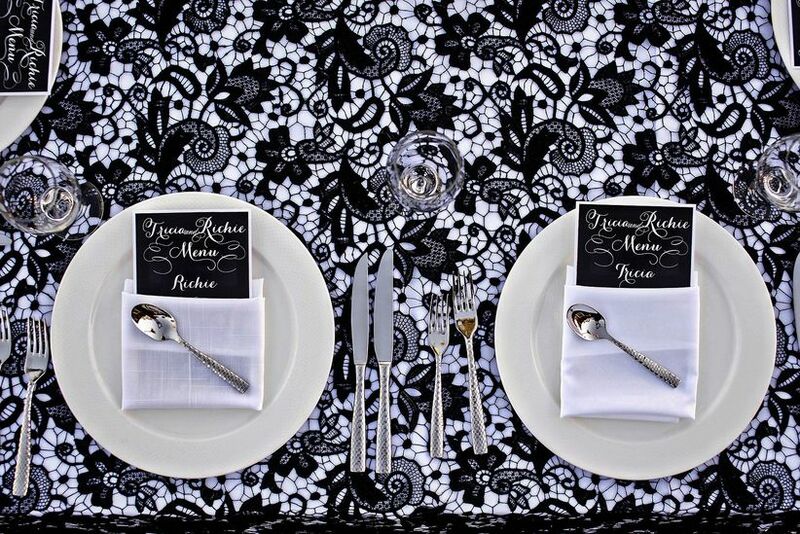 Check out these black wedding decor ideas for a variety of aesthetics and themes. Black is a daring, yet surprisingly versatile and elegant choice for your wedding color palette. 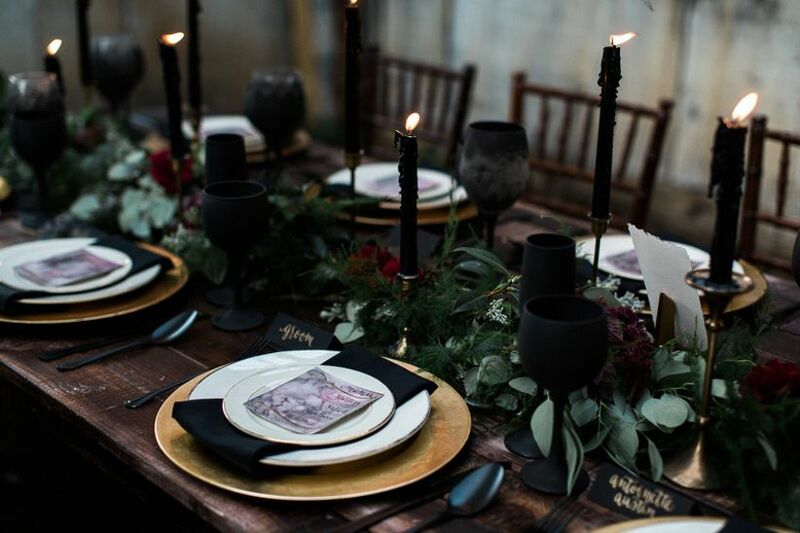 There's a reason why black is one of the most timeless and universal colors of all — depending on how you style it, black wedding decor can be formal, dramatic, modern, romantic, and even bohemian. Wondering how to incorporate this bold hue into your own big day? We've rounded up some of our favorite details. 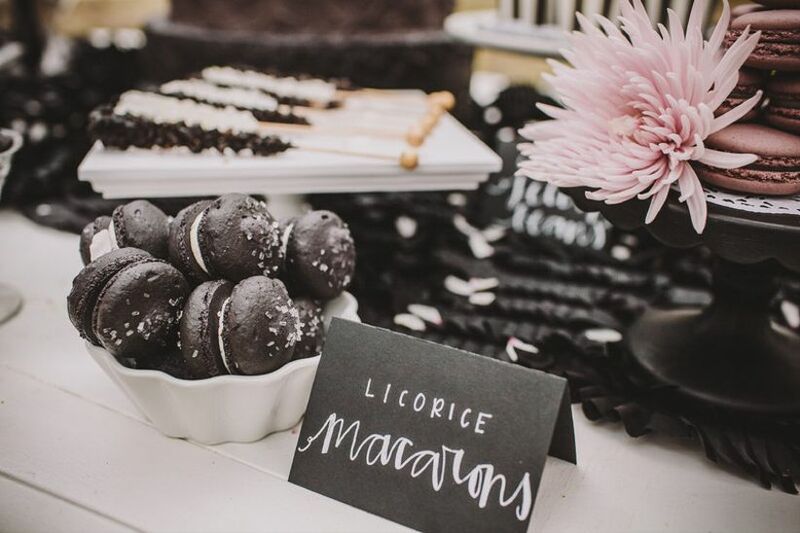 See why we're loving these black wedding decor ideas. 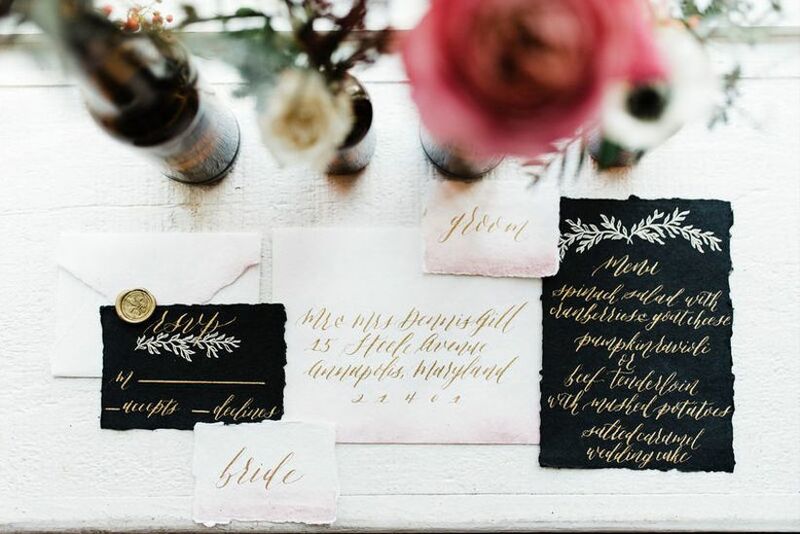 Offset the barely-there feel of a pale pink or white wedding invitation suite by including dramatic black inserts. When paired with swooping calligraphy, gold accents, and ethereal laurel wreaths, the black details don't feel overwhelmingly harsh or edgy, but instead add just the right amount of oomph. 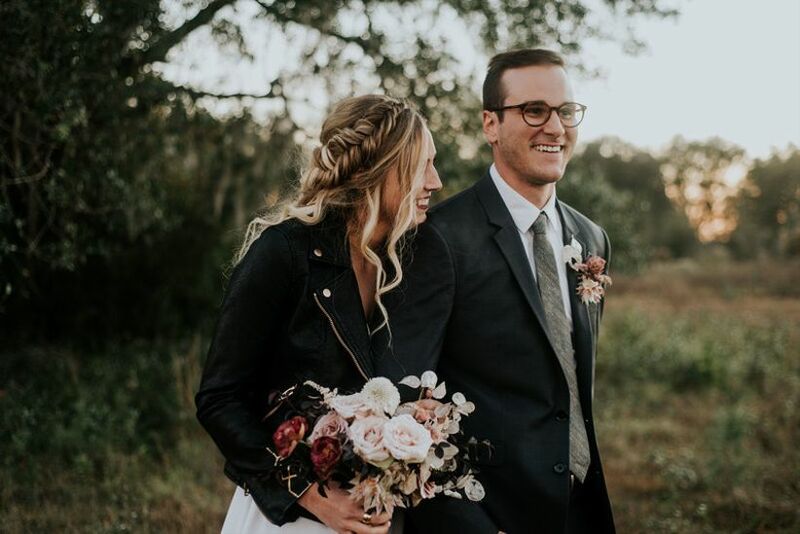 The vow exchange is one of the most special parts of your wedding day, especially if you are writing your own (here's a vow template, just in case). 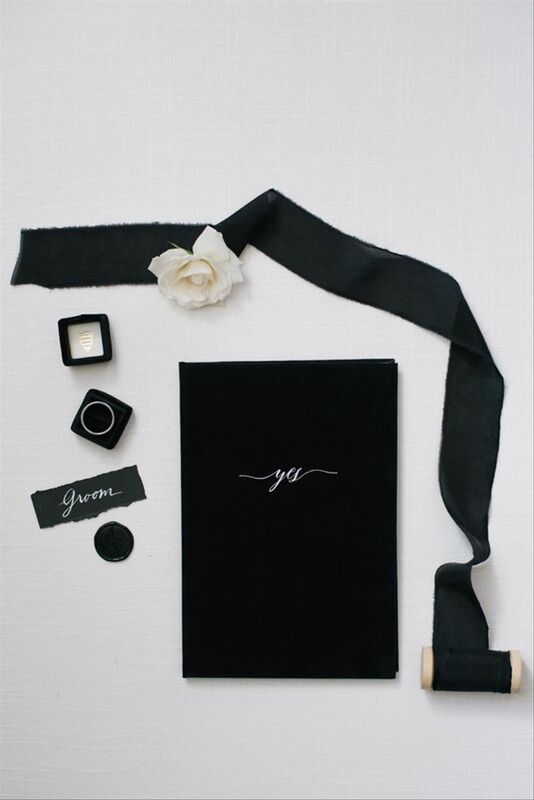 Jot down your words in a vow notebook with a sleek black cover to keep them preserved and ready to go for the ceremony. 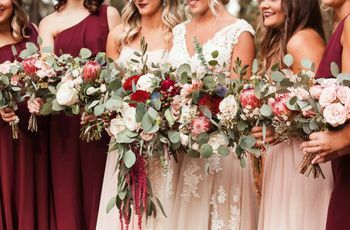 When you look back at your wedding photos, you'll appreciate the notebook, which is much more stylish than reading from your cell phone or a piece of scrap paper — trust us! Dare to be bold with your wedding shoes by opting for a pair of black high heels or flats. 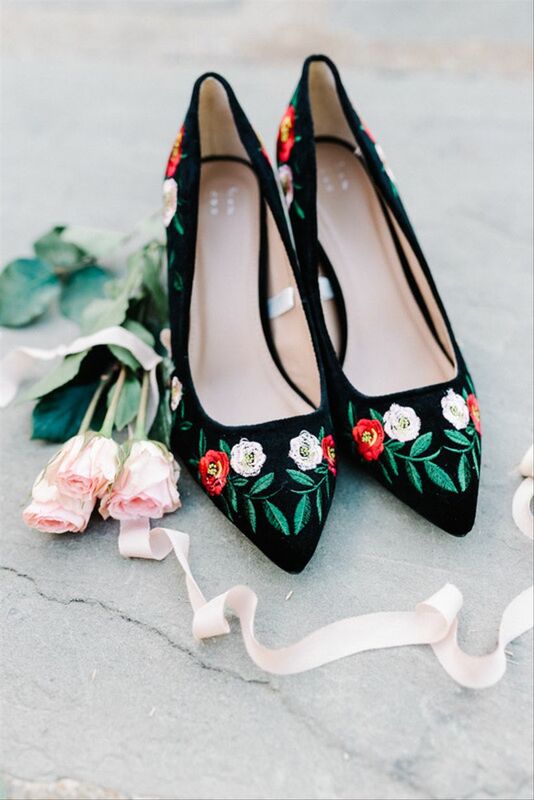 You can never go wrong with a classic black pump, but an embroidered floral style like this adds extra pizzazz that will tap into your fashionista side. The added benefit? 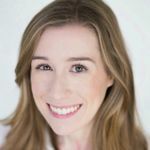 Compared to traditional white bridal accessories, they'll be much easier to re-wear again and again after the wedding day is over. Speaking of fashionistas, leather jackets are one of our favorite must-have accessories for the fearless bride. A moto jacket is the ultimate addition to any It Girl's wedding ensemble — how cool does this bride look? Since the leather jacket will be the main focus of your attire, keep the rest of your look polished but simple (don't go overboard with other accessories or trendy details). 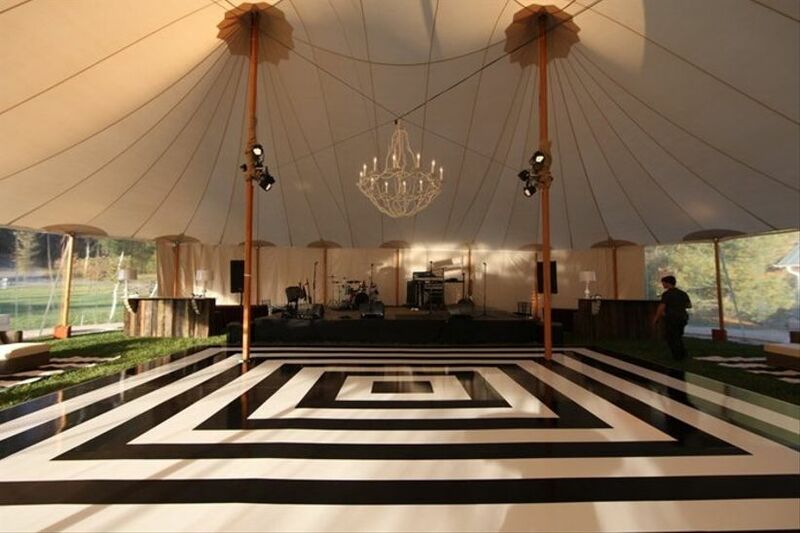 Why stick with a plain dance floor when you can have one featuring an eye-catching geometric pattern? We love this modern arrangement of alternating black and white squares, but you could also opt for a more traditional "checkerboard" style for a similar effect. Hints of black make a difference for even the smallest of details, like these lettered balloons. The combination of black against white is undeniably chic, and we love the sweet, wedding-appropriate message: Love is in the air! 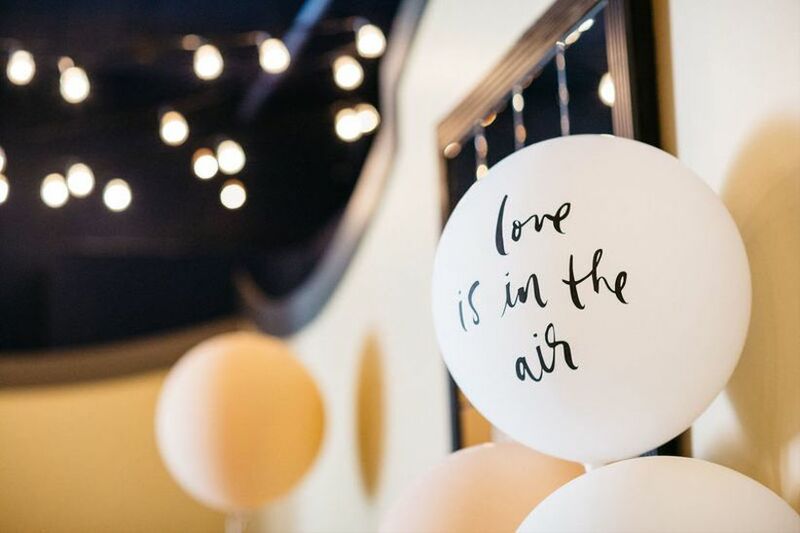 When choosing your black wedding decor, consider adding a few balloons like this to tie everything together and add a bit of whimsy. 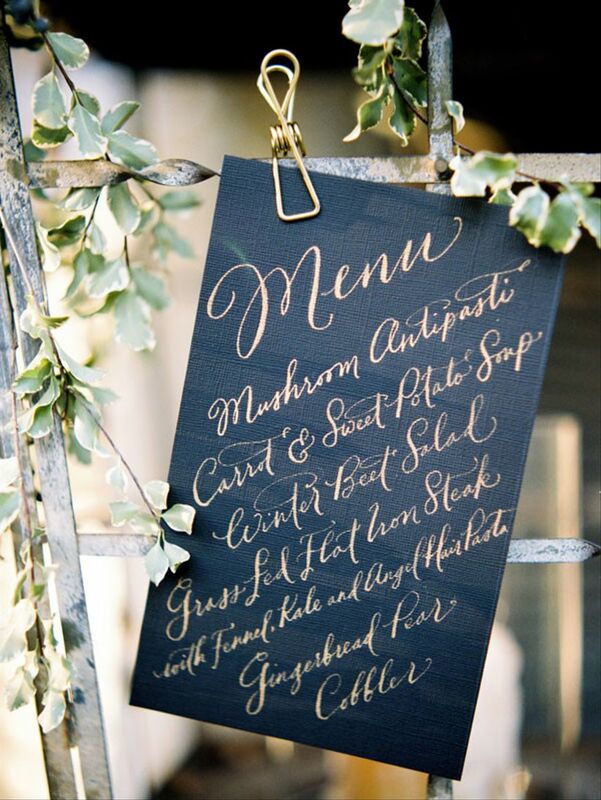 Black chalkboards are excellent for rustic and casual weddings, but this calligraphed menu signage is a gorgeous option if your theme is a bit more formal. 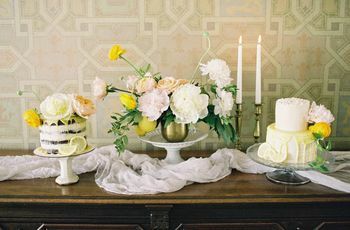 The gold and black combo with fresh greenery is sophisticated but not stuffy. 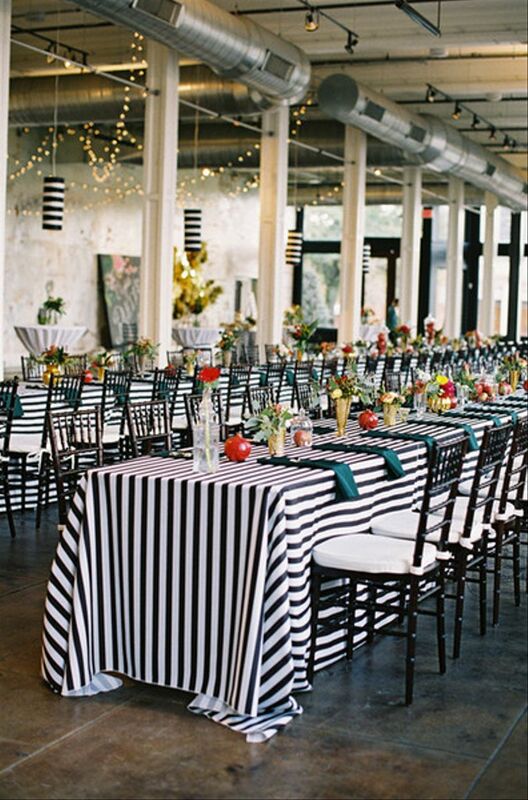 If you really want to make a statement with your black wedding decor, striped tablecloths will certainly do the trick! These can work for a variety of different styles — pair them with bright accent colors and quirky table decor (like fresh fruit) for a more whimsical effect, or stick with neutrals for a classic, slightly preppy look. Lace overlays are an alternative to striped linens if you want to incorporate a lot of black into your wedding tablescapes. This adds a "gothic romance" vibe to your tables, especially if you stick to a monochromatic black and white color palette. Since the overlays will stand out plenty on their own, you have the option of keeping the rest of your reception decor fairly minimal. 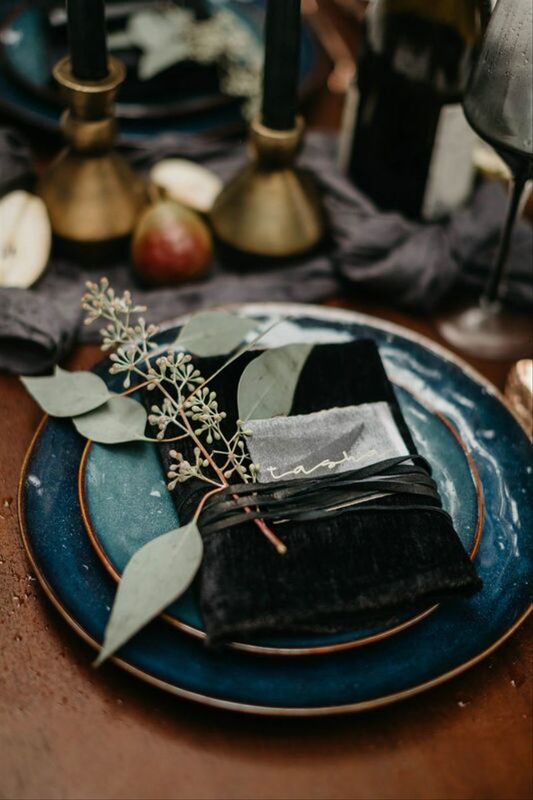 Black velvet napkins are an ultra-luxe alternative to standard wedding linens. 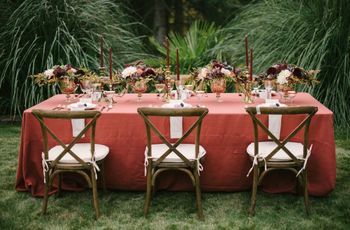 Play up a statement piece like this by adding creative place cards and fresh eucalyptus, then tying everything together with a piece of leather cord. 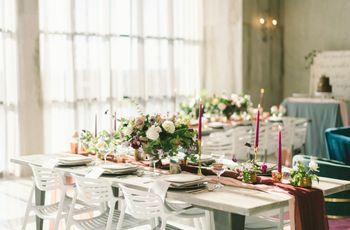 No matter how you use them, decorative candles will immediately change the ambience at your wedding reception. Instead of traditional white taper candles, opt for black ones, which will bring a sense of mystery and moodiness to the space. 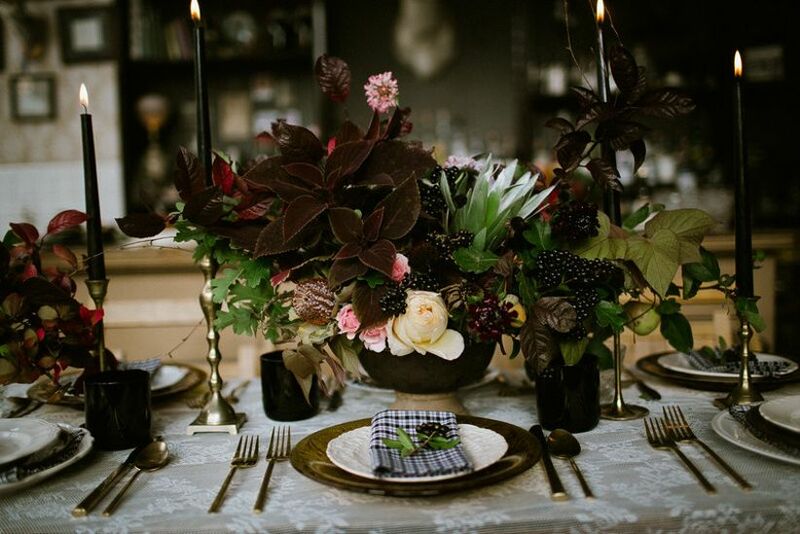 Pair the black candles with accents in dark colors, such as burgundy and purple, to create a tablescape that is perfect for a fall or winter wedding. A light box sign is an unexpectedly fun addition to black wedding decor if you're having a modern or minimalist theme. 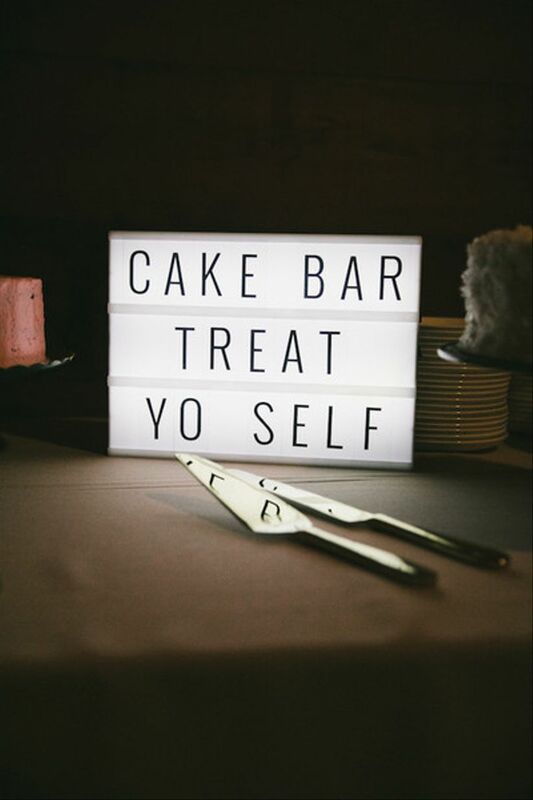 Use it to display an important message (like "Treat Yo Self") or get creative by using multiple light boxes as non-traditional table numbers. A black wedding cake may not be the norm, but that's what makes it so fabulous. 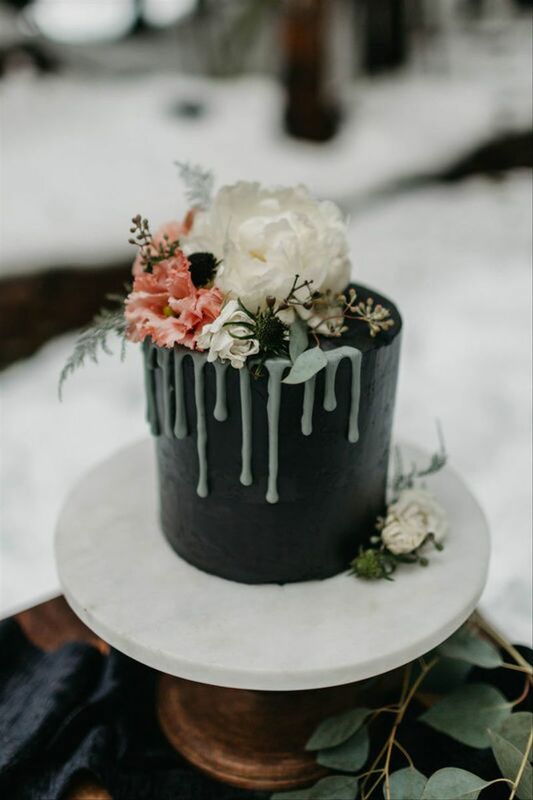 Wow your guests with a decadent black fondant drip cake that's trendy with a dark twist. Macarons are best known for their pretty pastel shades, but your wedding baker can easily make them in nearly any color you want. A licorice flavor and corresponding black hue gives these sweet treats a bit of offbeat flair.